That's right, we're now in Japan! So if things are looking a little different, that's why. Keat made it back, and I finally made it. Keat lasted about 5 months in Japan by herself, so both of us were about to go crazy. It wasn't too bad, because Keat was able to get things set up, like a bank account, phone number, and an apartment - which will be another video. We will compile all 3 videos (our house tour, her old apartment tour, and our current apartment) into a video soon, once we clean up and shoot a tour video. Regardless, we are in Japan, the cats made it, and we made a video about the flight process. We had to pack like crazy, because our house (the one in Waynesville) is still on the market, so if you're looking for a house in the NC mountains, we know one for sale! After we finished packing, we threw everything into our cars and drove down to Raleigh for a week, which was (supposed to be) a 4.5 hour drive. First, this was the longest that the cats had been in a car. 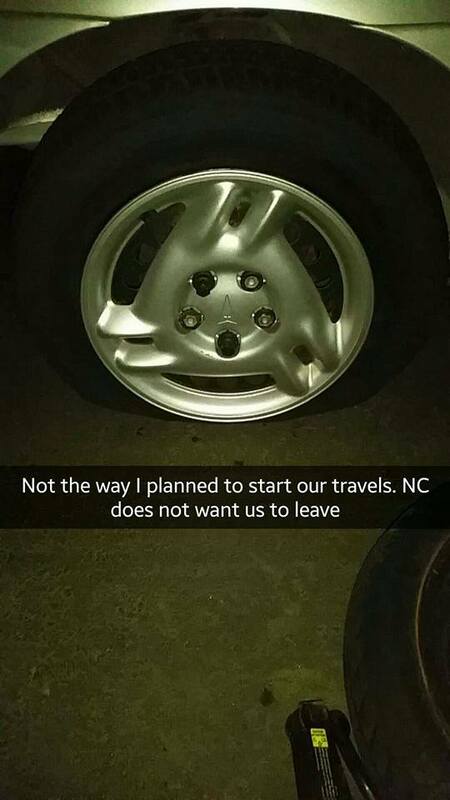 Second, NC apparently didn't want to let us go, because I had a tire come off the rim - at midnight! Long story short: we had to get a tow to the nearest town, find a pet-friendly hotel, and spend the night, leaving the next morning for Raleigh...again. After arriving at Keat's parents house in Raleigh, we put the cats in temporary storage, which they didn't like. We chose Keat's parents house because my parents house was a construction war zone. Meanwhile, the kitties were placed in the Sunroom, but there wasn't any air flow or any vents present, so the kitties would have roasted. 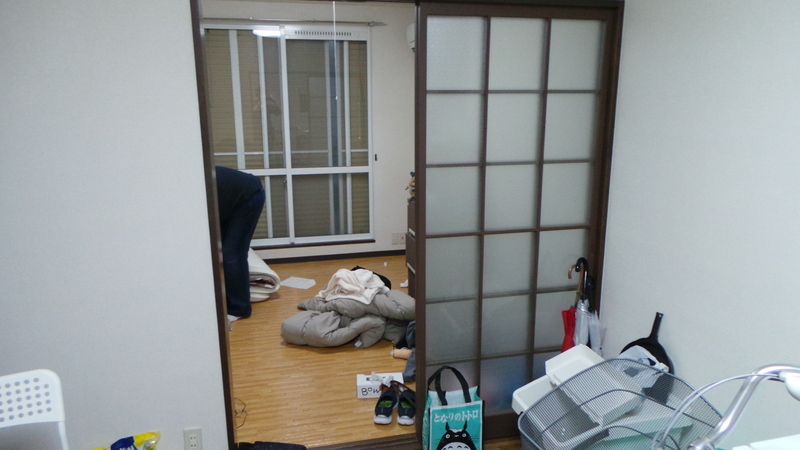 So they were transferred to the Laundry room, which was in between Keat's parents' bedroom and the living room. The kitties liked it, but Keat's parents did not, especially when Chi started meowing at 4am. So they were moved to the Sunroom during the night and the Laundry room during the day. That week we repacked and repacked so that each bag was 50 pounds or under. 2 bags per person x 2 people = 200 pounds of luggage. Yay. Additionally, we had 2 carry-ons, and the cats, so we were packed to the brim. We decided to have the cats as carry-on luggage, because we heard too many horror stories about pets being shipped or as checked bags, and we didn't want to put them through any of that - or lose them in the process. The day of our flight was a bit frustrating, because there was an accident on the highway, which backed up traffic. If we left any later, we would probably still be on the highway now! The flight from RDU to Atlanta was fairly easy, with the exception of Maru in a small carrier (because the 757 had a small "under seat" space, so we had to get a small 15" carrier for him). Once we reached Atlanta, we had an hour layover, so we thought we had some time. Instead, the incoming flight landed on the opposite side of the Atlanta airport from the International flights, and when we found our gate, we had to rush on the Atlanta Tram to go to the other side of the airport. Once we got to the departing gate, which had a large crowd waiting, we changed Maru into a larger carrier so he had some room to move and sleep, because a 777 has more space than the 757 did. The Atlanta (to Narita) flight started boarding once we got done, so we boarded as soon as we could. Tip: Most flights have a pet restriction. Delta (main cabin) has a limit of 4, so we had to pre-register the cats to make sure that there weren't any additional pets on the plane. To our surprise, the cats did really well. No meowing, no peeing, no scratching, etc. It was almost like the cats weren't even there. We did get some medication from our vet just in case they were loud or if a passenger was annoyed (Disclaimer: the medication was for the cats, not the passenger). The first half of the ATL-NRT flight went fast, meanwhile the 2nd half seemed to drag on. We arrived in Japan on Wednesday afternoon after leaving the US at 9AM Tuesday, so it was roughly a 13 hour flight. When we arrived, we were told to go to the Animal Quarantine Service (AQS) first before anything, so we're searching for the AQS desk. It turned out that we had to go through Immigration first, then go to AQS. Keat went through a different Immigration line than I did since she already had a residence card. Meanwhile, I went through the super-long-line of Immigration with all of the other 1st time foreigners, and I thought it'd be a good hour or so before I got through; instead, it took about 15 minutes, which wasn't too bad. After Immigration, we find the AQS desk before we find our luggage (which were on opposite sides of the luggage area). Once we arrive at the AQS desk (we were the only ones there), the doctor/guy behind the desk was expecting us. We verified some paperwork, the cats got a small physical examination, we signed some paperwork, and that was it. We wanted to get some video footage, but we were just too tired, and it was over before we knew it, so sorry - no video. When the AQS exam was over, the doctor guy came with us to get our luggage (which was the only luggage [aside from one bag] left on the luggage carousel). He helped us get the bags on some carts, then escorted us to Customs. 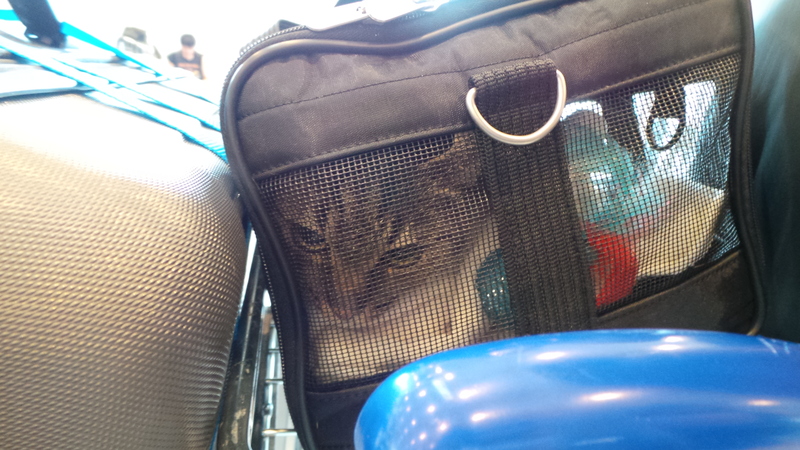 I was expecting the Customs process (based on the US) to take hours, going through every bit of our luggage and cats. Instead, the Customs agent asked one question, we answered it, then walked on through, so that was over within 30 seconds. The AQS doctor said "Goodbye" and we were on our way. So now, we had the cats and our luggage, and were in Japan. Keat found out from some friends that getting luggage delivered was fairly easy. So after finding the delivery desk, Keat explained (in her very bad Japanese) the situation, and they said that they could deliver our 4 large bags. Next day, between 2-4pm. For $67. Not too bad! Almost there! We inquire about the Suica card, and Keat gets me one. We packed up our carry-on bags and the cats, and rode the airport train to the Narita station, then rode the Narita line toward Chosi, and got off at Omigawa (about an hour). Walking from the station to the apartment was about a 10 minute walk, we released the cats, gave them some food, and crashed. We were that exhausted. So....that's the overall process that we went through. We have more videos in the works, including the experiences getting a Japanese cell phone, Japanese food, the Japanese shopping process, and even some neat little tips about surviving in Japan. Now that we are in Japan, please "Like" the video, subscribe to our channel, share the video, and do everything to get the word out, because we've made it. We love you guys for staying with us and enjoying our videos and posts. If you don't see a lot here, make sure to visit our facebook page which has a lot of photos that can't be made into a blog-post-worthy video, but still fun to look at.